Janhvi Kapoor, daughter of producer Boney Kapoor and late actress Sridevi, is all set to make her debut with Karan Johar’s production Dhadak. The newbie has been promoting her film all around the country with Ishaan Khatter. The film, which is a Hindi adaptation of Marathi blockbuster Sairat, has finally hit the big screen today. Earlier this year, both Janhvi Kapoor and Khushi Kapoor along with their father Boney Kapoor lost Sridevi. After her untimely passing, the industry folks and Kapoors have been a pillar of strength for the young girls. 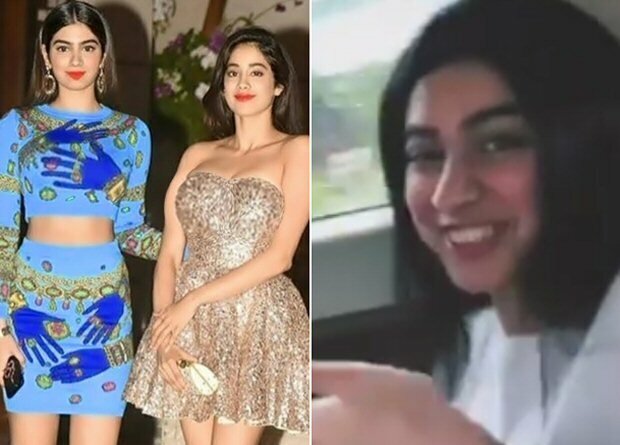 As the film has released worldwide, Khushi Kapoor is supporting her big sister in the best way possible. Khushi Kapoor, while driving with her friend on July 19, was playing the ‘Zingaat’ Hindi version in full volume in the car. Not only was she enjoying the song, but the teenager was also dancing and doing the hook step. No one seems to be more excited for the release of Dhadak other than Janhvi Kapoor’s younger sister Khushi. These two really make a cute pair of siblings. Dhadak is produced by Dharma Productions and is directed by Shashank Khaitan. It follows the story of Madhukar and Parthavi and their fierce and unconditional love that fights fate. But as their love grew, so did their problems as their families reject their love. Dhadak also stars Ashutosh Rana in a pivotal role.